Posted on March 29, 2018 at 11:47 am. Night Lights’ final showcase of the 2017-2018 season will be a screening of work from this season’s artists in residence Amy Chiao and Chloe Cooper. Since this season of Night Lights began last summer, Amy and Chloe have been building a life-size puppet made from plastic waste and filming its trips through public places in Portland. Documentation of these “Phil outings” will be projected at Open Signal’s exterior wall (2766 Northeast Martin Luther King, Jr. Boulevard) April 5th, 2018. This event is free and open to the public, beginning at dusk and lasting around two hours. Night Lights is a collaboration between Open Signal and the Regional Arts & Culture Council. Posted on February 28, 2018 at 11:21 am. Night Lights’ second showcase of 2018 includes work from the inaugural class of Open Signal’s Future Forum program, which provides an in-depth learning experience for socially driven media makers to improve their creative practice and teaching abilities as well as increase their engagement with the community. This year’s Future Forum artists include ariella tai, Ashlin Aronin, Jalessa Johnston, James Albert, Maura Campbell-Balkits, Fernanda D’Agostino, RaShaunda Brooks, Samantha Cohen, and Sophia Emigh. This event is free and open to the public, beginning at dusk and lasting around two hours. Posted on January 18, 2018 at 10:36 am. The General Operating Support (GOS) Grant Program – the single largest funding program at RACC – seeks to fund arts organizations across the community spectrum and help support a wide range of quality arts programming made available to the Portland tri-county public. Last year the GOS program funded 54 arts organizations and distributed over $2.4 million. The program was most recently revised in 2014, in anticipation of the Arts Equity & Access Fund (Arts Tax) in the City of Portland. Since 2014 we have had the opportunity to evaluate the way GOS funds reach the community and how much of our community benefits from GOS programs. RACC has also seen significant volatility in Arts Tax funding. Over the next several months, we will be re-evaluating the GOS program and making modifications that address these conditions while ensuring that the program is more transparent, flexible, and inclusive. By strategically revising our funding model, RACC hopes to foster a richer, stronger, and more diverse arts community. With change comes uncertainty and we understand how challenging that can be for our arts community. RACC has committed to holding member organizations receiving General Operating Support at current funding levels though next year (FY18-19), but anticipates announcing the new grant program structure in Summer 2018 to be implemented in FY19-20. Posted on January 3, 2018 at 3:30 pm. The Professional Development Grant Program assists artists or arts administrators with opportunities that specifically improve their business management development skills and/or brings the artist or the arts organization to another level artistically. The RACC Board of Directors approved these Professional Development Grants on December 13, 2017. Posted on December 15, 2017 at 4:16 pm. As part of its ongoing focus on equity and inclusion, RACC has established a goal of directing at least 30% of its programs and resources to culturally specific communities and people of color. In this round of project grant awards, 29% of the funded individual artists identify as people of color—the largest percentage since RACC began tracking this data in 2010. RACC is still working to quantify the cultural identity of organizations and to measure the demographics of their audiences. The RACC Board of Directors unanimously approved all panel recommendations on December 13, with awards in three categories: Artistic Focus, Arts Equity & Access, and Arts Services. Artistic Focus projects help artists realize their vision, and help organizations support their artistic mission. Examples funded in this round include $6,150 for Ropa Vieja, a fashion show and book launch presented by the multicultural collaboration “cvllejerx,” Angelica Milan and Maximiliano Martinez; $1,315 for Stacey Tran’s ongoing storytelling series Tender Table about food, family, and identity featuring women and gender non-conforming people of color; and $4,815 to Corrib Theatre for their production of Quietly, a play presenting a powerful scenario of truth and resolution in present day Northern Ireland. Arts Equity & Access grants support programs and services with a strong community engagement component, including festivals, arts education projects, and programs that expand arts experiences for underserved communities. World Stage Theatre is receiving $6,500 to lead a city-wide Black History Festival in February in locations spanning as far east as Troutdale and west to Beaverton. Jeffrey Thompson will be leading his “Stay Sharp” drawing for life workshops at an assisted living facility in North Portland for seniors with his award of $5,596. Pacific Youth Choir will continue their outreach choir classes at two neighborhood elementary schools with their $6,500 award, with high school age student mentors, field trips, and a series of concerts. Arts Services grants include projects that provide professional development opportunities for the arts community, including workshops or conferences. In this category, PDX Puppet Collective and the Secret Knowledge conference will be receiving funding to provide training programs that provide artistic growth for participants. A complete list of project grants appears below, and more detailed summaries of each grant are available at http://bit.ly/2CBoGra (PDF). Posted on December 15, 2017 at 10:29 am. Project grants, which had been offered only once a year, are now available three times per year. The next project grant deadline is February 7. Guidelines and application can be accessed at https://racc.org/apply. Posted on November 28, 2017 at 11:46 am. RACC is conducting a Request for Proposals (RFP) for Audit Services. The Finance & Audit Committee seeks three-year audit service proposals from CPA firms with extensive experience in providing audit services to non-profit organizations. Interested firms must send a Letter of Intent to apply to: auditrfp@racc.org by 12/15/17. A description of how your firm is qualified to provide audit services to RACC and why your firm is interested in participating in the audit services RFP. Brief description of your firm, including location, staff size, and industries served. Brief description of engagements that your firm currently conducts in the non-profit sector. Include a list of local non-profit clients that you believe are comparable to RACC in size and complexity. Please provide your firm’s equity statement. Please limit your LOI to a maximum of 3 pages, including your equity statement. Based on the information provided in the LOI, firms with relevant experience and capacity will be invited to participate in the full RFP process. Letter of Intent Deadline: 12/15/17. Audit Services RFP Closing Date: 1/31/2018. Posted on November 27, 2017 at 1:49 pm. Posted on November 13, 2017 at 3:37 pm. The Right Brain Initiative is one month into the 2017 Willamette Week Give!Guide, Portland’s innovative online fundraising campaign. Give!Guide showcases 149 local non-profits of various sizes whose missions fall into eight categories: Animals, Civil & Human Rights, Community, Creative Expression (you can find Right Brain here), Education, Environment, Health and Human Services. Give!Guide In thirteen years, G!G has raised over $20 million for hundreds of local nonprofits. Last year, Give!Guide donors gave nearly $4.25 million to 141 Portland organizations and the Oregon Cultural Trust. Last year, 270 incredible Right Brain donors helped us raise $19,121, equipping us with the funds to support four schools and 1,500 students with arts education programming. This year, we are on a mission to empower over 29,000 students and 1,700 educators to discover their creative voices. We’re encouraging our stakeholders to express their own voice by supporting young creative thinkers. We need our entire community to work arm-in-arm with us to create lasting change within our schools so that every kid has the chance to discover their inner artist! Willamette Week Give!Guide originally began in an effort to encourage young people to engage in philanthropy. They have a mission of getting the 3,500 Portlanders under the age of 35 to give back to their community by making it really easy to give (149 nonprofits all on one online platform with an easy interface). There’s also a competition among the nonprofits within each category of the Give!Guide to have the most “young donors” by the end of the campaign, earning that organization an extra bonus of $2,000. These organizations bring to 55 the number of arts organizations in Clackamas, Multnomah and Washington Counties that receive annual, unrestricted operating support from RACC. GOS grants range in size from $8,000 to $427,000 per year depending on the size of the organization. A list of other GOS organizations and their historical funding amounts is available online at http://bit.ly/2y79puH. Eleven organizations applied to be included in GOS this year. A panel of RACC board members, Angela Hult, Anita Menon, James Smith and Katherine Durham, ranked all organizations on established criteria that include financial health, artistic innovation and audience engagement. Among the four organizations recommended for funding, the panel noted a strong commitment to engaging with underserved communities, and plans to strengthen their ongoing equity work. The panel’s recommendations were approved by the RACC board on October 25. Posted on October 24, 2017 at 1:04 pm. Mauricio Robalino’s “Bird” sculpture was dedicated on Saturday, October 21st as part of the Grand Opening of Luuwit View Park. The Grand Opening was put on by Portland Parks & Recreation and ran from 11 am to 2 pm. Attendance was high despite the rain. Events were officiated by Commissioner Amanda Fritz and began with a blessing by Native American Ed Edmo, a Shoshone-Bannock poet, story teller and educator. The artist, Mauricio Robalino, was introduced to the crowd by Parks Director Mike Abbaté and was enthusiastically cheered. Mauricio’s abstracted “Bird” sculpture, which features glass mosaics sides, stands 16 feet high on a promontory on the western side of the park. Luuwit is the Native (Upper Cowlitz) word for Mount Saint Helens. The park is located directly north of NE 127th Avenue and NE Fremont Street next to Shaver Elementary School. 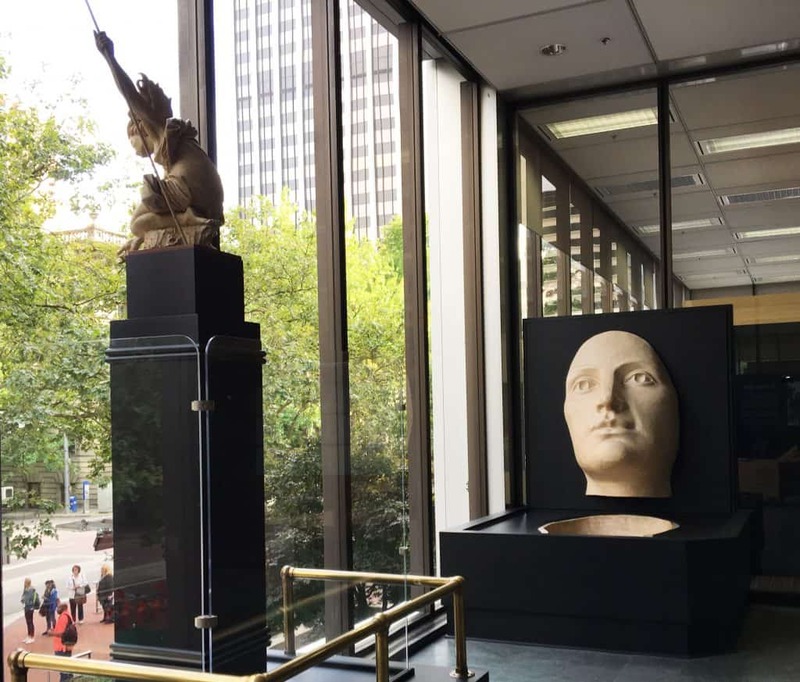 For more information on Mauricio Robalino visit www.artpeople.com, and for more information on Luuwit View Park https://www.portlandoregon.gov/parks/65392. Posted on October 18, 2017 at 3:37 pm. Fresh Paint, a temporary mural wall project, began in early 2017 as part of a new professional development initiative of RACC’s Public Art Murals programming. Three artists have been selected to paint a temporary mural on an area of the exterior west-wall of Open Signal facing the highly-visible Martin Luther King Jr Blvd. Each mural will be up for a period of four months and then painted over in preparation for the next mural. The pilot program for Fresh Paint is a partnership between RACC’s Public Art Murals program and Open Signal, a community-driven media arts center. Artist participation required living in the Portland metropolitan area, having a consistent studio or mural practice, and not having received any public art commission through RACC nor having created an exterior mural in the City of Portland. The selected artists will receive a stipend for their participation and are offered the opportunity to engage with the myriad of resources at Open Signal. Alex Chiu is the artist currently on display. His mural is a nod to stop motion animation, one of the many media classes offered by Open Signal. In addition, he will be teaching a youth animation class this fall. Illustrator Molly Mendoza was the first artist to participate. 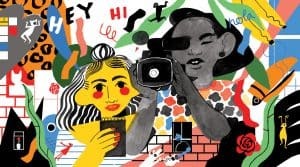 On display from May – September, her mural was a nod to Open Signal’s youth programs with a vibrant image of Portland youth engaging with the community through broadcasting and video media. The third artist will be featured in early 2018. SHIFT: An experiment in fashion design was an evening for the books! Posted on September 28, 2017 at 2:30 pm. It was more than a runway show. It was a community celebration. It was the start of a new tradition. On Thursday, September 21, 2017 SHIFT: An experiment in fashion design brought together some of the region’s most innovative design thinkers to celebrate equitable education and sustainable fashion and benefit our arts integration program The Right Brain Initiative. Nineteen novice and experienced designers alike debuted garments made from recycled materials and found objects in effort to win three cash prizes and the People’s Choice Award. The energy of the runway show extended into our silent auction and paddle raise, contributing to a final net income of nearly $25,000 raised for The Right Brain Initiative. Read a full recap of the event and see more photos on the Right Brain blog: https://therightbraininitiative.org/shift2017recap/. Posted on September 28, 2017 at 2:23 pm. narrative questions, artist resume, two letters of recommendation, and examples of the artist’s work, are reviewed through a panel process of community representatives from the discipline being honored. This year’s panelists in the literature category included Mo Daviau, Merridawn Duckler, Christopher Luna, Orit Ofri, and Olivia Olivia.